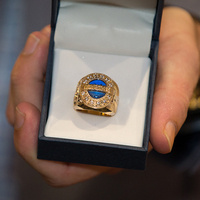 Jostens and the Office of Alumni Relations invites graduating students the opportunity to participate in UTA's traditional Official Maverick Ring Presentation Ceremony. Two ceremonies are held each year — a Spring ceremony in May and a Fall ceremony in December. The Maverick Ring Ceremony marks a special time in a Maverick’s life — when they receive their Official Maverick Ring, a lifetime symbol of their pride for The University of Texas at Arlington. Ring recipients should receive an invitation with instructions on how to RSVP for the ceremony. Guest parking for the ceremony is in the College Park Center's South Parking Garage.